There are Bluetooth speakers made to be super light and portable, while others are still wireless, they are not portable. It's important to check out the product specifications before buying to ensure it meets your expectations. Before purchasing a speaker, it is important to review the run-time of the speaker. If you want music during nature hikes or days at the beach, you shouldn't settle for anything with less than a 12-hour run-time so it won't need to be fully charged to last the day. Don’t forget to check the charge time too. High-quality speakers will only need 2 or 3 hours to charge up the battery entirely. Lower quality speaker won’t include Qualcomm quick charging technology. Shoppers should also consider durability, price, connectivity options, and audio quality. The following is a review and comparison of the Oontz Angle 3 Plus. The Oontz Angle 3 Plus is technically the fourth generation of Oontz speakers and continues the brand’s tradition of delivering decent sound at an affordable price. This speaker offers a modern minimalist look that blends effortlessly into any contemporary decor. This ultra lightweight speaker has a rugged exterior, 30 hours of battery life, and two 1.7" precision neodymium drivers and a bass radiator. The Oontz Angle 3 Plus speaker can produce rich sound despite its small size and relatively low price. The triangle design separates the two neodymium acoustic drivers from the bass radiator to enhance audio clarity. The two drivers deliver clear highs and mids while the bass radiator produces an unexpectedly deep bass for a speaker of this size. The speaker components appear to be protected by a sturdy aluminum grille. The side covers of the speaker are constructed from soft silicone that resembles a soft cell phone cover. This helps provide a shock-absorbing casing for the speaker, but it collects dirt easily; It may require frequent maintenance if you like keeping your gadgets clean. It also has two long rubber feet at the bottom of the speaker to keep it from moving around while playing bass-heavy audio. The build quality is great at being lightweight, but it impacts the sound quality. There are only two ports on the entire speaker: a micro-USB port for charging the speaker and a 3.5mm auxiliary port for use with non-Bluetooth devices, which are covered by a watertight rubber flap. Whether you’re pairing it with a Bluetooth device or using the auxiliary cable, it only takes minutes to set up and use. Out of the box, the speaker is ready to use, and it includes both cables, except it doesn’t include the wall adapter for the micro-USB cable. The speaker is one for minimalists due to its limited features, but if the user doesn’t read the Quick Guide, they may not know about the dual function Bluetooth button that also works as call management. However, connecting devices takes only a minute or two, especially with the auto-connect feature that most Bluetooth devices carry. Turn on the speaker, and it will connect to the last device automatically as long as it is within range and the Bluetooth is on. If you’re fussy over sound quality, don’t expect the quality you’d get from your home stereo system, but this is still a decent micro-speaker. Like with a lot of inexpensive speakers, the performance can be a little uneven, and it can even sound flat, but it also depends on the content being played. To keep the speaker from distorting, a digital signal processor (DSP) limits the maximum volume and also strips out certain frequencies to prevent the speaker from distorting. There is a boost in the treble, but that’s a popular trend with manufacturers these days to help the speaker sound clearer and it doesn’t go too far. Because of DSP, speakers, this small sound reasonably good in the midrange and vocals come across sounding natural. The bass from this speaker can be impressive, but it disappears at lower volume levels. To power on the device, short press the power button. It should chirp and the blue LED should blink slowly. This means the speaker is in pairing mode. From your source device, select Oontz Angle 3 Plus. Once they’re successfully paired, the speaker should chirp again, and the blue light turns solid. There is a newer version of the Oontz Angle 3 Plus that now includes track navigation buttons, removing the former dual functions from the volume buttons. However, the Bluetooth button still functions as the call management button. When receiving an incoming call, press the Bluetooth button to answer it or short press it for three seconds to reject the call. You need to keep this speaker close to you so that the mic picks up your voice. You must use your phone to switch between speaker and hand-held modes. The volume controls on the source device and the speaker work independently. Set the phone's volume to the highest level to control the volume from the speaker’s controls. To control the volume from the source device, put the volume all the way up on the speaker and keep the device handy to adjust the volume from there. The source device will need to be within 30 unobstructed feet, and the speaker will need sufficient charge to make an adequate connect. Turn on the speaker and check the blue light. If the light is solid, the speaker automatically connected to the last source device. The Angle 3 Plus will auto-connect with the last source device each time it is turned on, and that device is in range. To prevent this, turn off the remembered device before turning on the speaker. Users can also short press the Bluetooth button for three seconds to put it back into pairing mode. The speaker will let you know when it’s time to charge by a slow blinking red light by the power button. It blinks once it reaches fifteen percent or lower. You can use the micro end of the charging cable to open the flap easily. It will continue blinking while it is charging and will stop blinking once fully charged. Using the speaker while charging or keeping it plugged in should not harm or damage the speaker. When playing from battery power, it will turn off after 15 minutes of silence to conserve battery life. When it is plugged in or connect to an Echo Dot, it will remain on until the user turns it off. You will know the speaker is off by the lack of the blue LED. It seems a lot of customers confuse water resistant and waterproof. With a rating of IPX5, this speaker is not waterproof. It cannot handle being submerged at all, even in a shallow puddle. It can handle splashes and up to 12.5 liters of water per minute running along the surface of the speaker, as long as both of the ports are fully sealed by the flap. If it's left open and exposure to a wet environment for a period, it can lead to unrepairable damage to the speaker. There are a quite a few options for buying the Oontz Angle 3 Plus speaker. 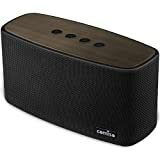 The Cambridge SoundWorks website has the speaker on sale for $38. When it’s not on sale, it can cost as much as $85. Amazon has a listing for with free shipping. eBay also has a few listings, but if you want the warranty, buy it from an official retailer. If it’s not on sale, you’re better off buying a better speaker for the price. The Anker Sound Core offers a wider connectivity range than the Angle 3 Plus, but the run-time is 6 hours less. 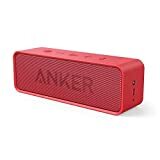 Anker claims the speaker provides full-bodied stereo sound, but there are certain types of audio that the speaker distorts. It only rates IXP5, which means it is not waterproof, but splash proof. The SoundCore has a unique, patented spiral bass port. It works to help lessen harmonic distortion to ensure enhanced audio clarity, but some tracks still lack bass. Users reported a faulty Micro-USB port; it stops charging after a few weeks or months. In terms of warranty coverage, Anker takes care of quality-related issues for up to 18 months after purchase. Unless the user purchased it from an unauthorized retailer (like eBay) or the product is misused. The WonderBoom is one of the better sounding micro speakers on the market. It produces a great sound for its size, but depending on the audio, the bass distorts at higher frequencies at high volume. It has an IXP7 water-proof rating For about $20 more the WonderBoom comes with a 2-year warranty and sound that is still consistently better than many of its competitors. However, the WonderBoom only has a 10-hour battery life. It doesn't take as long to charge as some speakers do, but it doesn't last as long as the Angle 3 Plus. The EU button on top the speaker, multi-functions as the play/pause button, track navigation, and as the connect button to daisy-chain two speakers together for augmented sound, but there is no way to set up the stereo sound. User reviews claim it connects easily, using innovative Bluetooth 4.0 technology. Depending on the purpose of your purchase, the WonderBoom might be a better choice. Originally, the Comiso Speaker went for $50, but it's now listed on Amazon for around . The Comiso weighs about 3 pounds and has a battery with the capacity of 5200mAh. This speaker also has an output of 30-watts to provide a full spectrum of audio with clarity and super deep bass, but there are still claims of it sounding muffled with certain content. The Comiso speaker includes a 12-month warranty, but some users reported that the speaker would not hold a charge or the buttons stop work by that time. Bluetooth speakers are rapidly gaining in popularity due to their portability and compact design. Compared to other Bluetooth speakers on the market, the Oontz Angle 3 Plus is a great buy for budget shoppers, looking for a handy speaker to take with on outings that won’t run out of battery power in the middle of the day, but it probably won't last an extended hiking trip. Cambridge SoundWorks knows how to build a quality, easy-to-use product. The Angle 3 Plus is one of the more simplistic and durable ones on the market, but the design sacrifices sound quality for the rugged build. The Oontz Angle 3 Plus is easily comparable to speakers in higher price ranges. Speakers like UE WonderBoom and Anker SoundCore may cost more than the Angle 3 Plus, but it has a higher water resistance rating than the SoundCore and has a much longer battery life than the WonderBoom. We consider the Angle 3 Plus a decent deal for that price. The Oontz Angle 3 Plus is technically the fourth generation of Oontz speakers and continues the brand’s tradition of delivering decent sound at an affordable price. This speaker offers a modern minimalist look that blends effortlessly into any contemporary decor.